Home / Articles / EFIWE ARTICLE: Everything You Need To Know About Hon. (Dr) Olatoye Temitope Sugar @sugaryouthforum | READ! EFIWE ARTICLE: Everything You Need To Know About Hon. (Dr) Olatoye Temitope Sugar @sugaryouthforum | READ! Hon. (Dr) Olatoye Temitope Sugar is a member of the Federal House of Representatives, Abuja representing the good people of Lagelu / Akinyele Federal Constituency and the Chairman, House Committee on Urban Development and Regional Planning for the Federal Republic of Nigeria. Hon. 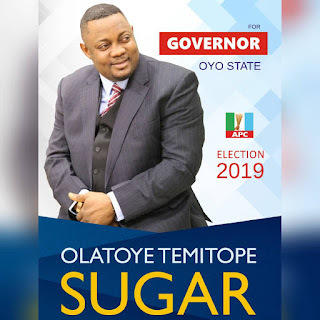 Temitope Sugar hails from city mother-earth of Efungade-Onigbodogi compound, Alafara Oje in Ibadan North East Local Government Area of Oyo State while his ancestral villages are Onigbodogi and Alape both in Lagelu Local Government Area of Oyo State. The young Temitope had his primary school education at St Paul's Anglican and St Michael Catholic Primary Schools, Yemetu, Ibadan. He then proceeded to Ikolaba Grammar School, St Luke’s College, Molete and Alugbo Comprehensive High School, Egbeda, all in Ibadan, Oyo State for his Secondary School education. In order to pursue his dream as a teacher, Hon. Sugar attended Federal College of Education, Osiele in Abeokuta, Ogun State and the University of Ibadan, Oyo State, Nigeria. His preference for community development advocacy propelled him to pursue a post graduate degree in Community Development and Adult Education at the University of Ibadan where he bagged a Master’s Degree. He then proceeded to the United Kingdom to earn another Master’s Degree certificate from NARIC. He was later awarded an Honorary Doctorate Degree in Public Administration and Governance by the foremost European-American University in the Commonwealth of Dominica. Hon. Sugar’s thirst for knowledge propelled him to attend several trainings abroad which include: Legislative Training Conferences in United Kingdom and the United States of America (USA), Community Development Training in South Africa and Strategic Leadership and Management in Stratford, London. Hon. Sugar pursued his love and passion for teaching when he taught as a professional teacher at Sagamu High School, Makun, and Orile-Ilugun Comprehensive High School both in Ogun state before his political vibrancy was crowned with political appointments. Hon. Temitope Sugar’s political career started with a political appointment as a Supervisory Councillor in Odeda Local Government. He was then appointed as a Special Adviser at the State level in Ogun State under the administration of His Excellency, Otunba Gbenga Daniel having been the PDP Youth leader in Ogun Central Senatorial District for years. 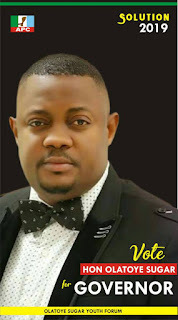 His love for his home state, Oyo, motivated him into sponsoring political developments in Oyo State from Ogun State even before his full adventure as a Chairmanship Aspirant in Lagelu Local Government Area of Oyo State in 2007 under the umbrella of People’s Democratic Party (PDP) and he later became the PDP National delegate of Oyo State in the year 2008. Having been edged out of his political home, the PDP, where he used unquantifiable human and material resources to gain support from his ward to the national level, Hon. Sugar did not give up on his aspiration but went ahead to contest on the platform of the then newly formed Accord Party. Backed by the love and support of the masses and downtrodden, he was elected into the Oyo State House of Assembly in 2011 where he performed creditably well to the commendation of the Oyo State Governor, the Pegunrun and Koseleri 1 of Oyo State himself. His Excellency, Governor Adeyemi Abiola Isiaq Ajimobi, was impressed by the outstanding performance of Hon. Sugar at improving the lives of people in his constituency and beyond through his several people oriented programmes and empowerment. 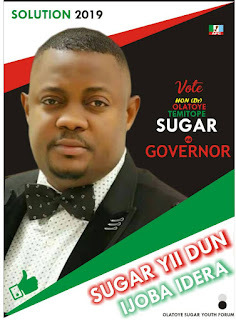 Hon Sugar’s good works, exemplary achievements and increasing political profile in the main politics of Oyo State endeared many within and outside the state which earned him an invitation to join the then Action Congress of Nigeria(ACN). He also actively participated in the formation of the current ruling party, the All Progressives Congress (APC) in Oyo State. Aside from being an accomplished politician, Hon Sugar is a great philanthropist with a passion for selfless service to humanity. He possesses a charitably personality and his compassion for the masses prompted the establishment of a renowned foundation named OLATOYE SUGAR FOUNDATION (OSF) in Nigeria and the United Kingdom through which he has reached thousands of people and restored the hopes of hopeless. Hon. Sugar has engaged in numerous philanthropic activities which include: provision of infrastructural facilities like; good roads and water (Modern Boreholes) to many communities, transformers to towns that have been in darkness for several decades, free mobile health facilities for basic health care and free surgeries covering hernia, cataract and fibroid to the good people of Oyo State, donation of health support facilities to Oyo State Maternity Hospital, Adeoyo, Ibadan. He has also been involved in the yearly empowerment of people living with disabilities, building of schools in several communities and provision of scholarships for indigent students, building and equipping facilities for Oyo State Police Command and Divisional commands, building facilities for Broadcasting Corporation of Oyo State, BCOS, Amuludun FRCN, Ibadan and presently, he is about to complete the building of an ultra-modern facility for the first Television station in Africa, NTA, Ibadan. These and many more underscore the vision of Hon Sugar’s foundation, OSF, which is ‘to see a society where the less privileged are fully transformed to be self-reliant’, beginning with the development of his alma-matter which is the Oyo state’s socio-economic welfare, political and infrastructural development. He is a fellow of United State's Institute of Educational Management and a member of Nigeria Institute of Strategic Management. Hon. Sugar Olatoye is also a member of Senior Staff Club, University of Ibadan and the foremost Omo Ajorosun Club, Ibadan. It is noteworthy to state that, Hon. Sugar is an ardent investor majorly in agriculture. He is also on the board of Everlasting Group, owners of one of the largest farms in Oyo State, Everlasting Farms, Everlasting Garden and Hotels, Everlasting B & T Nig Ltd, Everlasting Motors, Ajumose Everlasting Sugar Low Cost Housing Estate, Lagelu, Ibadan and Greenfield Oil & Gas, Lagos. - Aare Afiwajoye of Iseyin Land. - Balogun Moliki Owode, Egbaland, Ogun State. - Asalu of Gbagura Land, Abeokuta, Ogun State. - Maiyegun of Oyere, Ile Ife, Osun State. - Jagunmolu NATA of Nigeria. - Anobi of Owoland, Ondo State. - Merit Award, University of Ibadan. - Award of Recognition as Outstanding Supporter of Education, Spring-Worth Group of School, Lagos. - Best Performing Legislator, 7th Assembly, Oyo State House of Assembly by South West Leadership and Enterprise. - Most Outstanding Legislator, 2014 by Oyo State NATA. - Award of Excellence by InterContinental Magazine. - Award of Distinction in Sports Development by Organisation for Grassroots Sports Development, Oyo State. - African Embodiment of Sacrifice Award by ANTP, Oyo State. - Most Responsive Oyo Federal Legislator 2015 & Humanitarian Award of Excellence by Nigerian Persons with Disability Vanguard. - Excellent and Exemplary Leadership Award by Nigeria Union of Journalists (NUJ), Oyo State. - Oyo State Man of the Year Award by 2016 South West Excellence Awards. Hon. Temitope Sugar is sociable and loved by the good people of Oyo State beyond ethnic and socio-political boundaries and as such, he has worked harmoniously with almost all the renowned political heavyweights of Oyo State in general within and outside the corridors of power since the return of our most cherished modern democracy in 1999. Hon Sugar is perhaps the most accessible politician in Oyo State. Hon. Sugar in addition to being a shrewd politician is also a talented sportsman and has played football for some clubs in Nigeria such as Shining Star Football Club, Superstar football Club and Allah’s Will Football Club all in Ibadan, Oyo State. He also played for Champion Football Club, Lagos State. Hon. (Dr) Olatoye Temitope Sugar is a happily married with beautiful and promising children. With all the endeavours and accomplishments presented above, it is apt to describe Honourable (Dr) Olatoye Temitope Sugar as a visionary leader that the good people of Oyo State need to pilot the affairs of the state come 2019 by ensuring that; acute hunger is fought to stand still and guarantee youth employment through massive agricultural and industrial revolution, infrastructural development, free health care delivery, qualitative educational development at all levels, passionate social welfare for the women, aged / people living with varying disabilities, rural and urban upgrade as well as opening up the hidden economic potentials of all the geo-political zones of the pace setter state.Hon. (Dr) Olatoye Temitope Sugar is a member of the Federal House of Representatives, Abuja representing the good people of Lagelu / Akinyele Federal Constituency and the Chairman, House Committee on Urban Development and Regional Planning for the Federal Republic of Nigeria.